J. Jeff Beckman is currently an Adjunct Professor of Music Education at Vanderbilt University, Blair School of Music and the Supervisor of all Residency I and II Music Education students at Tennessee State University. 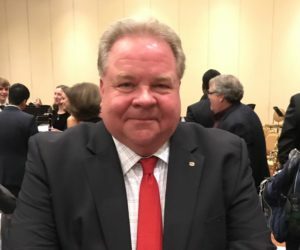 He works in the Macy’s Parade Band Division of Students on Broadway in New York City and is also the Executive Treasurer for the Middle Tennessee School Band and Orchestra Association. Beckman is an active Adjudicator and Festival Director throughout the Southeastern United States. He was formerly the Co-Director and Director of Bands at McGavock High School for twenty-seven years. He was also the Team Leader for the Center of the Creative Arts and Chair of the Music Department at McGavock. During his tenure, the McGavock Band was named the Tennessee State Marching Champion fifteen times, Grand Champion at the Contest of Champions in Murfreesboro, Tennessee ten times, Grand Champion of the Bands of America Southern Regional Competition three times, and a finalist at the Bands of America Grand National Championships. They received numerous superior ratings in both concert and marching festivals and competitions. The McGavock Band participated in the Macy’s Thanksgiving Day Parade in New York City, New York, the Orange Bowl Parade in Miami, Florida, Hollywood Christmas Parade in Hollywood, California, and Boscov’s Thanksgiving Day Parade in Philadelphia, Pennsylvania. In 1994, both the McGavock Band and Mr. Beckman were awarded the Sudler Shield Award presented by the John Philip Sousa Foundation. The National Band Association awarded Beckman the Certificate of Merit for Marching Excellence three times. In 2005, he was named “Teacher of the Year” at McGavock High School and received the “Educator of the Year” award from the Donelson-Hermitage Chamber of Commerce. Beckman was most recently awarded the “Carol Crittenden Arts Advocate of the Year”Award for outstanding support of Music Education and the Performing Arts in Middle Tennesseeand was elected as the newest member of the “Tennessee Bandmasters Hall of Fame” this past spring.